The food police are the unreasonable rules in your head, created by dieting and diet culture, that cause you to feel guilty. These rules are housed deep in your brain and pop up on a daily basis to govern your food decisions. It’s impossible to view eating as a normal, pleasurable activity when the food police have hold. 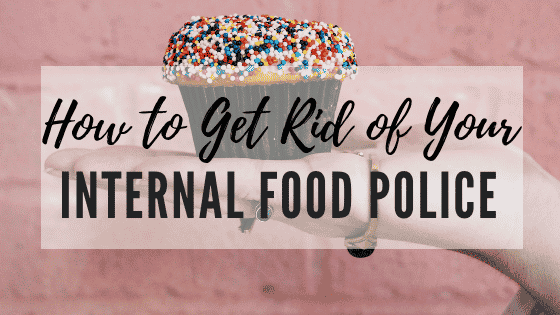 Here’s how to get rid of the food police – an important step towards becoming an intuitive eater. As a dietitian, I’ve been accused of being the “food police” more times than I can count. But I don’t judge people’s restaurant orders or the food in their shopping carts. But do you judge your own? Probably. 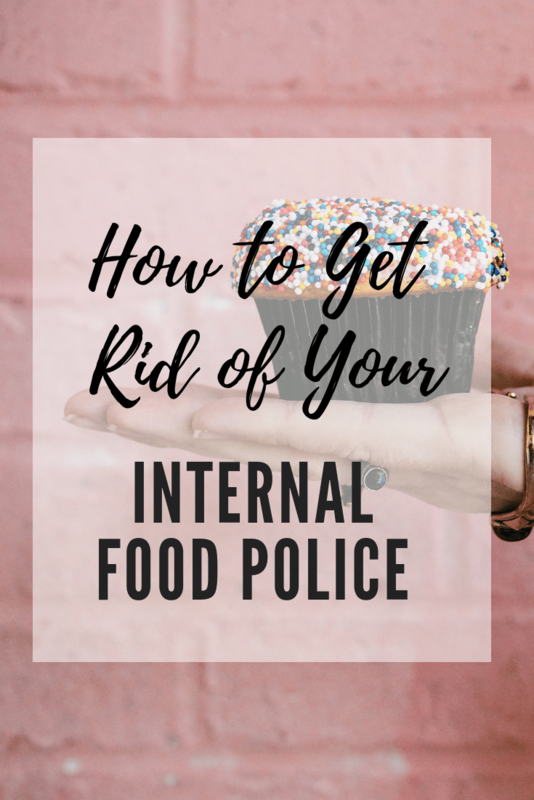 It’s called the internal food police – we all have them. They’re those thoughts in your head that declare you as “good” for eating lower-calorie foods or as “bad” for eating a cookie, burger or nachos. The food police are the dieting rules housed deep within your brain that monitor your food choices and judge everything you eat (or don’t eat). You already had a cookie last night; you can’t have another today. I know your stomach is growling, but it’s not time to eat yet; you have to wait for dinner. You can’t have that bagel; it has way too many carbs. That was too big of a meal – better make sure you go to the gym to burn it off. You ate a sandwich for lunch, so no bread at dinner. You’ve eaten so well this week – you deserve that dessert. While some of these rules might not seem bad, they can be harmful because they use external factors to dictate food choices rather than internal ones. Even if you’re not dieting, your inner food police are still around. These daily reminders make it tough to view eating as a normal, pleasurable activity. Instead, any time you eat becomes a situation in which you’ve either succeeded or failed. Choose a salad for lunch and you’ve been good. Have fries with your burger and you’re bad. This food police voice sets impossible standards and, when you do break a rule, sets you up for overeating (because what the hell – the day is already shot, right?). Firing the food police allows you to make food choices based on health and satisfaction, rather than on diet rules or deprivation. If you make or reject a food choice in the name of health, but then feel guilty for eating the food or sad for not having the food, the food police still have a hold of you. But once these food police thoughts are gone, you can be interested in healthy eating with no hidden agenda. 1. Make observations without making any judgments. Thoughts like, “I skipped breakfast and was starving by 12 p.m.” or, “I had those cookies last night but didn’t pay attention to how they tasted” are free of judgment. An intuitive eating journal can help you get used to making observations like this. Instead of tracking calories and fat grams, write down how you feel before and after eating. This can include your hunger and fullness levels, mood, cravings, energy level, body sensations and any judgments you note. 2. Change the tape that plays in your head. I had many times this week when I honored my hunger. I am learning to trust myself with food. I am learning to include foods I find satisfying and enjoyable. I am learning to overcome past food rules. This is a process, and I am doing great. Dieting is a form of linear thinking, with a step-by-step progression in which the focus is the result. Any misstep or perceived failure can set you up for overeating. The fix for linear thinking is process thinking. Rather than focusing on the result, concentrate on continual change and learning. This means acknowledging that there will be ups and downs, but also that there’s a progression forward. For example, after a big dinner out you might say, “I ate more than I wanted, especially dessert. But I learned that by permitting myself to eat dessert, it took away the urgency to have sweets again later at night. Usually, I would have eaten more at home.” Focus on the small wins and know that these successes will add up over time to propel you forward toward a better relationship with food. Want to learn how to eat mindfully? Download my free e-guide Five Minute Mindful Eating Exercise now! I thought this article was great especially for Step 4 of Intuitive Eating on challenging the food police! I have shared this article with my clients who suffer from disordered eating and they have found all of the tips to be extremely helpful! However, I do not entirely agree with the tip of clients with disordered eating tracking how they feel before and after they eat food. I believe it is crucial for them to certainly realize and focus on how they feel before and after they eat, however I do not believe they should track it and write it down. That is because I have had clients who track every single in their lives including their meals and they would even track a list of “bad foods” and how they felt after eating those bad foods and would subtract the calories from the “bad foods” they ate to the number of recommended calories they should have a day. I feel as if they start tracking how they feel it could become restrictive and even detrimental to their progress because if they review what they wrote after writing down how they felt after eating it could cause them to feel guilty for eating that certain food or meal. Just my thoughts! Overall, I find this article to be extremely helpful. Hi there, I agree with you that sometimes journaling can trigger similar feelings to tracking/logging that people did during their diet days. It’s an individual thing so I always discuss with clients that if this is something that feels triggering, we should either not do it or find a way to make it less triggering. Thanks for your comment!